Newton's Nook Designs: SEAson's Greetings & Inky Paws Inspiration by Samantha Mann! 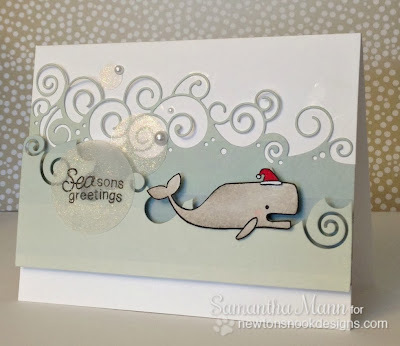 SEAson's Greetings & Inky Paws Inspiration by Samantha Mann! Today I'm sharing some more inspiration from Design Team Member Samantha Mann for our inky paws challenge. She created this beautiful card Inspired by the current challenge sketch (see below) and using the SEAson's Greetings Stamp set. This is really beautiful, don't you think? I love the layering and the vellum. It has so much dimension! Her card doesn't match the sketch exactly-- but that's ok! Remember the sketch is just a starting point to inspire you! For full details and to see what else she's up to make sure to visit Samantha's blog Sam's Scrap Candy. Did you know you have just a couple days left to enter our Inky Paws Challenge #4? There's still time - the deadline to enter is Friday, November 8th, 2013 at Midnight CST! You can view full details and link up your card and enter the Inky Paws Challenge on this post. If you don't own a NND stamp set yet you can still use the digital freebies on our freebies page here. What a wonderful showcase of Mr. Whale, sporting his Santa hat. The swirly ocean - amazing! Samantha's scene is absolutely spectacular! Inspiring, plus!! Oh this is WHALEY cute!!! He's adorable and ready for the holidays! I love the whale card! Beautiful! Cute CAS card--adorable kitty image and gotta love the 'joy' sentiment since that's my name! Thanks for sharing and for contributing some blog candy for this drive.